With the canonization of St. John Paul II, the parish continues to offer Masses of Thanksgiving for that blessed event. You are welcome to celebrate these Masses offered in memory of St. John Paul II. 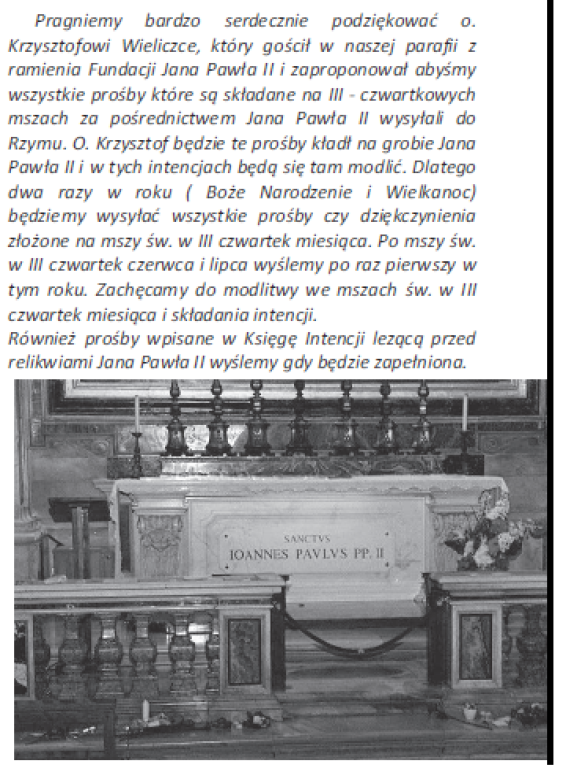 After the Mass, the relic of St. John Paul II is available for public veneration. Prayer requests for future miracles and thanksgiving for answers to intercessions are placed at the Shrine area throughout the month and on this day are placed on the altar during the celebration of the Mass. During the recent visit of Fr. Christopher Wieliczko, David Krakowski showed him the thousands of private letters and prayer requests placed into the shrine which currently holds both the miter as well as the first class relic of St. John Paul II. He proposed that we send all these personal notes to him at the Vatican where they will be placed on the altar where St. John Paul II is buried (inside of St. Peter's Basilica. These intentions and notes will subsequently be taken for safe keeping at the Vatican archives If you would like to include a note to St. John Paul II at this time, please do so. The current batch of notes will be sent to Rome following the June 16th Third Thursday Mass in honor of St. John Paul II. Afterwards, the letters will be sent to Rome twice a year in January and June. Papers and pens are located alongside the kneeler at the shrine. Please add your intentions or any thoughts you want to share personally with St. John Paul II...he is waiting to hear from you!